Niagara Falls is a popular family vacation destination, and with good reason. Not only are there dozens of ways to take in the splendor of one of the most spectacular natural wonders of the world, there are hundreds of other activities to fill your days. From museums and aquariums to hiking and biking to immense arcades and water parks, Niagara Falls has it all. With so much to do and see, you might be wondering how to pack for your adventure. We’ve put together a list of things that you definitely don’t want to forget, as they will ensure that you have a great time on your getaway. Located on the border of the U.S. and Canada, Niagara Falls offers activities on both sides of the border. In order to explore everything and get the most from your trip, you’ll want to cross the border, either on foot or by car, and to do so, everyone in your family needs a valid passport. Without it, you’ll have to remain on the New York side of the falls. Be sure to apply for your passport (if necessary) at least 6-8 weeks before your trip to ensure it arrives on time. Most of the major attractions around Niagara Falls are within walking distance of each other, which is a good thing because parking is at a premium. 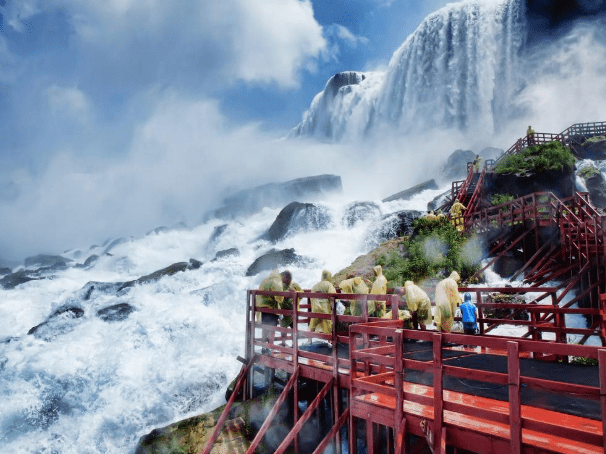 Some of the best activities, such as the Journey Behind the Falls, Cave of the Winds, and the Rainbow Bridge that crosses the Niagara River require a great deal of walking, including stairs that get wet, so a good, sturdy pair of comfortable shoes is a necessity. No, you won’t be swimming in the river – it’s illegal, not to mention dangerous to even attempt to enter the water – but several hotels feature indoor waterparks that the whole family will want to check out. In fact, some of the best Niagara falls hotel deals include waterpark admission, so you definitely want to make sure that the whole family brings their swimsuits. It might be a no brainer, but you definitely don’t want to forget your camera. While you can certainly capture the beauty of the Falls with your smartphone camera, this is one place where you want to think about bringing your “good” camera if you have one. There are so many vantage points for viewing the falls, not to mention all of the other attractions in the area. Be prepared to capture many memories and gorgeous landscapes! Weather can be unpredictable in Niagara Falls, and when a sudden shower appears, you’ll be grateful to have a raincoat and umbrella. 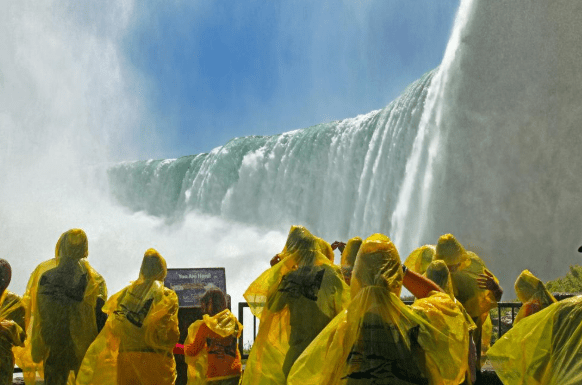 However, even when the sun is shining, you can expect to get wet at some of the area’s most popular attractions, such as the Maid of the Mist (or the U.S. side) or Hornblower Cruise (Canadian side) boat ride. When you board this cruise to the base of the Falls, you’ll be issued a plastic poncho, which will keep you mostly dry, but they aren’t exactly known for fitting well or being comfortable. If you have your own rain jacket or poncho, you can wear it on your trip – and you won’t have to worry about recycling the plastic one when you leave the boat. And speaking of unpredictable weather, you may want to carry a light jacket or sweatshirt if you will be exploring in the evening, especially in the late spring or early fall. Northern evenings can get chilly quickly, and you don’t want to be cold while exploring the nightlife. Finally, it’s worth bringing an easy-to-carry backpack or shoulder bag to carry your gear when exploring the Falls. Many attractions have security bag checks, but they typically move quickly. Choose a lightweight bag that can hold your rain gear, camera, and any souvenirs you pick up, but that is waterproof or water resistant to keep everything safe and dry when you visit watery attractions. There is so much to do and see in Niagara Falls that you’re likely to leave saying “Next time, we have to do …” with a list of things you didn’t have time to enjoy. The area literally features something for every member of the family, and if you’re well-prepared with these items, you’re sure to enjoy them all.